The Cathedral of Saint Paul as we know it today is actually the fourth building to bear that name. 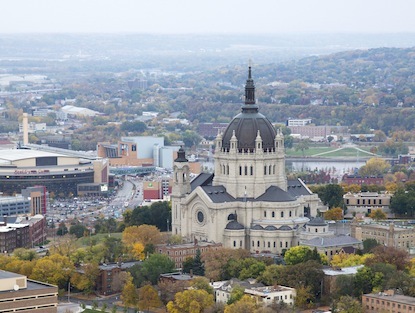 From its humble beginnings as a small, log chapel overlooking the Mississippi River to the current majestic incarnation overlooking the city, the Cathedral of Saint Paul has grown and adapted to the changing needs of its growing parish and the Archdiocese. 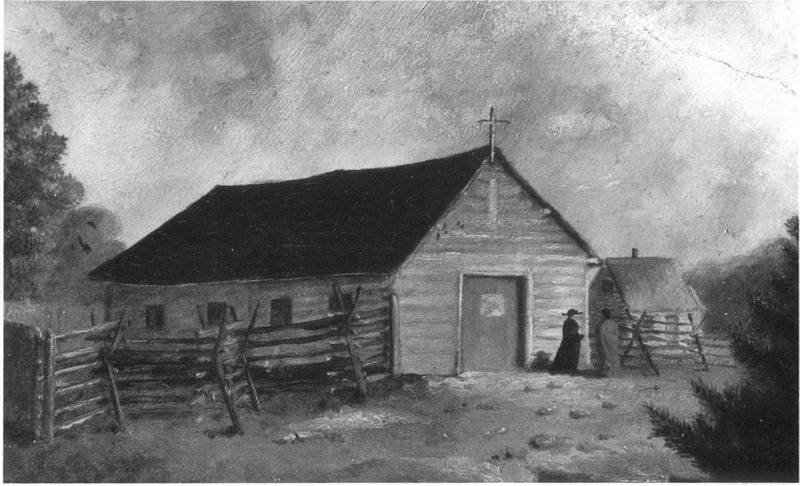 In the spring of 1840, the newly ordained Father Lucien Galtier was sent to the settlement of Pig's Eye to minister to the French Canadians. His first task was to find a suitable place for worship. After investigating several locations, he selected a site on a bluff overlooking the Mississippi River, easily accessible by land and water, and two farmers donated the land. Construction of the log chapel began in October 1841, and Galtier dedicated the chapel on the Feast of All Saints Day in 1841. With its unshaven sides, bark-covered roof and surrounding areas of trees and bramble, the chapel reminded Galtier of the stable in Bethlehem. He placed the community and the chapel under the patronage of Saint Paul, with the hope that the entire Pig's Eye settlement would soon adopt the name, which, as we know today, did happen. Father Galtier first used the name "Saint Paul" for the settlement on the marriage certificate of Mr.Vital and Miss Guerin. Galtier was succeeded by Father Augustine Ravoux in 1844. He immediately found the small structure too cramped for the needs of his growing parish, and built an addition, doubling its size. 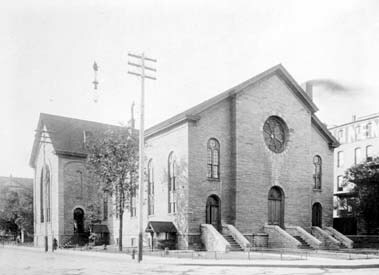 When Joseph Cretin was installed as the first Bishop of Saint Paul on July 2, 1851, the humble chapel was formally proclaimed the Cathedral of Saint Paul. At his installation, Bishop Cretin was troubled by the large numbers of worshippers forced to stand outside during the service. The population of the Diocese now numbered nearly 3,000, far too large for such a modest structure. Bishop Cretin immediately made plans for a larger cathedral in downtown Saint Paul. Within five months of his installation, the new cathedral was completed, dedicated and in use. Total project cost, including land acquisition, was $5,900. 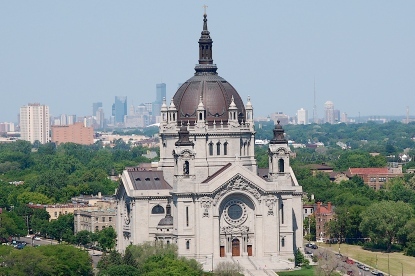 From the day of its dedication, the new Cathedral of Saint Paul was already hopelessly cramped. The church itself was on the second floor of the three-story 84-by-44 foot structure. Living and working quarters for the Bishop, Brothers of the Holy Family and seminarians were on the third floor. 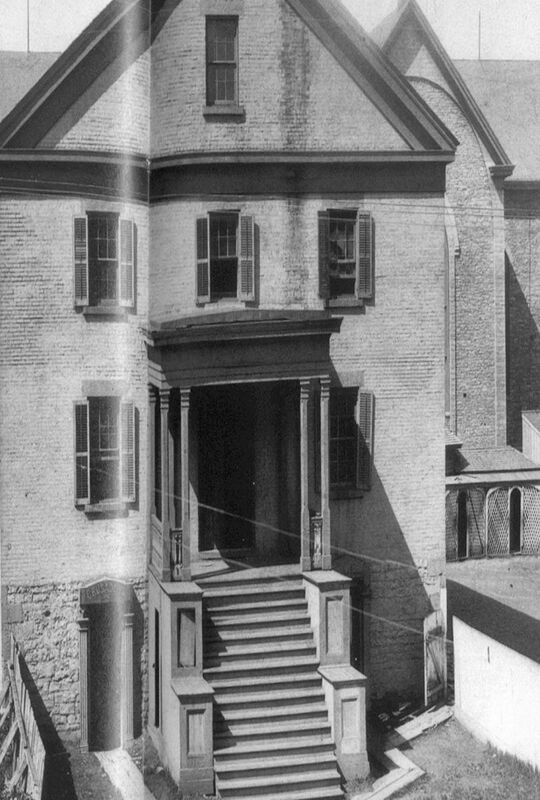 The first floor contained a library, kitchen, parlor, dining room, school and store rooms. Just two years after the completion of the second Cathedral, Bishop Cretin initiated plans for yet another Cathedral to accommodate the growing Catholic community. He envisioned a Cathedral that would reflect the growing prestige and prosperity of its parishioners. Advertised widely as the most impressive religious structure west of Chicago, it would be built of stone, measure 175 by 100 feet and boast a steeple 250 feet high. Work began on the new Cathedral on the corner of Saint Peter and Sixth Streets in July 1854 and the cornerstone was laid on July 27, 1856. Bishop Cretin was overjoyed with the progress of his parish, but died less than a year later. In the financial panic of 1857, all work on the building stopped. Augustine Ravoux was named diocesan administrator in 1858, and he was determined to complete the Cathedral. Due to lack of funds, he removed all architectural ornamentation from the original design, including the towering steeple. What remained was a solid, spacious and inexpensive structure. 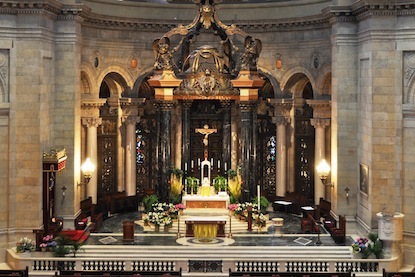 The first Mass was celebrated at the third Cathedral of Saint Paul on June 13, 1858. Work continued on the interior of the Cathedral though the early 1860s. The final cost of the structure was $33,647. Thomas Langdon Grace was installed as Bishop of Saint Paul in July 1859, and was immediately confronted by the same problem that had plagued his predecessors â€“ not enough space. During his tenure, he began to plant the seeds for yet another building project. Upon his retirement in 1884, the challenge and vision of a new cathedral was passed to his successor, Archbishop John Ireland. Having already established that he would build a great cathedral, the task that now fell to Archbishop Ireland was enormous. He first favored sites in what is now the Midway district, situated centrally between the cities of Minneapolis and Saint Paul. However, no land could be acquired and Ireland soon set his sights on other properties.In a chain of events that moved so rapidly, Archbishop Ireland believed them to be a sign from God, the current site on Summit, Selby and Dayton Avenues was chosen for the new cathedral. In 1903, Charles H.F. Smith and A.B. Stickney, two prominent local businessmen, offered to purchase the Kittson Mansion on Saint Anthony Hill, an ornate but neglected Victorian home, for use as the archepiscopal residence. Ireland immediately rejected the offer, citing the frivolity of such an ornate home for a bishop's residence. But in April 1904, Archbishop Ireland went back to Smith and H.C. McNair and informed them of his desire to build a great cathedral on the Kittson land. They immediately obtained the Kittson property and deeded it to the church. Ireland later noted that "seldom has an act of mine received such universal approval as the selection of that site." Shortly after the purchase, Francesco Cardinal Satolli, Apostolic Delegate to the United States, visited Saint Paul and gave the entire effort the sign of Roman favor. Archbishop Ireland moved quickly to assemble a Board of Consultors, representing Catholics from all parishes of the Archdiocese to assist in the task of building the Cathedral. At the first meeting, 205 laymen and 100 priests from the area gathered to make "the initiatory step towards the realization of the great project." Ireland then named 12 laymen and six clergymen to the Executive Building Committee, which initially focused on financial issues relating to the building project, but soon turned their thoughts to the selection of an architect. 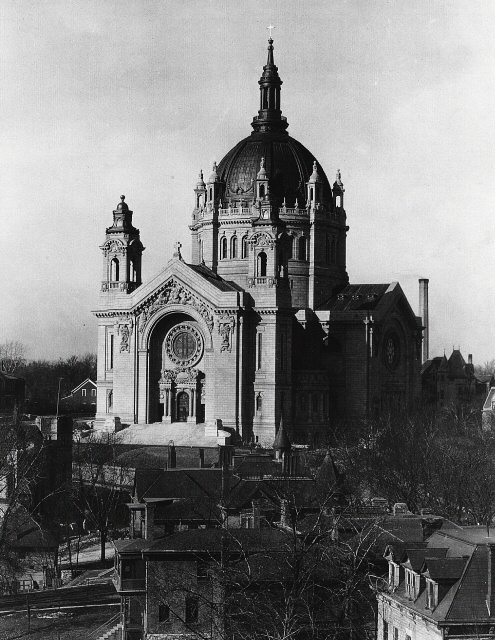 In June 1905, Emmanuel Louis Masquery was selected to design the Cathedral of Saint Paul. In January 1906, he received approval for his designs from the Executive Building Committee and work on the structure commenced. The cornerstone was laid on June 2, 1907, in a grand celebration attended by more than 60,000 people from across the state on a sunny summer afternoon. The Cathedral's exterior was completed in late 1914, and work then began in earnest on the interior. Archbishop Ireland had decided that the first Mass was to be held on Easter Sunday, 1915. Crews worked around the clock, and the Cathedral was ready for worship on Palm Sunday--one week early. The interior finishes were completed as funding allowed and work on the Cathedral would continue over the next 25 years. But funding was not the only challenge the Cathedral would face. In 1917, Masquery died suddenly, and Archbishop Ireland passed away just over a year later. Before his death, Masquery had designed three of the Cathedral's major chapels: Saint Peter's, Saint Joseph's and the Blessed Virgin Mary's, but a great deal of work remained to be done. In 1930, Archbishop Dowling passed away and Bishop John Murray completed many of the Cathedral's final projects. By 1933, the east rose window had been installed and builders were beginning to attach the marble veneer in the vestibules. 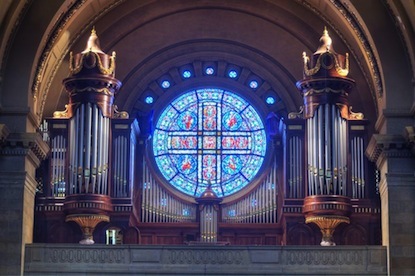 In 1941, the last two rose windows were installed, and the fourth and grandest Cathedral of Saint Paul was essentially complete. Archbishop William O. Brady consecrated the Cathedral in 1958 in a five-hour rite. The Rite of Consecration is not often performed and a church must meet strict canonical requirements: it must be durably constructed, monumental in character, substantially complete and there must be absolute certainty that the building will never fall out of the hands of the Church. When this solemn ceremony was performed, it raised the Cathedral to a higher level of prestige. 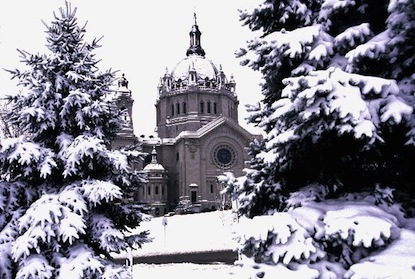 The Cathedral of Saint Paul is now formally recognized as an "edifice of merit," worthy of assuming its place among the premier houses of worship in America.